One million dollars in hundred dollar bills will not even fill up a normal size briefcase. Well-suited for illegal transactions, it weighs only 22 pounds and travels easily. Where are we going? To demonetizing larger denomination cash. 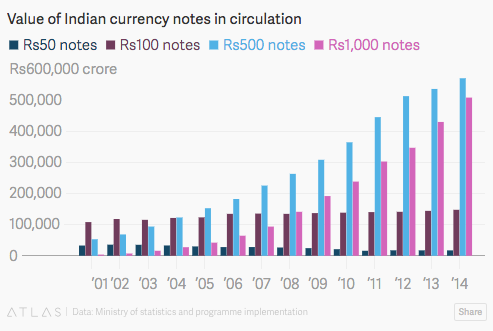 By the beginning of 2017, India will no longer have its existing 500- and 1000-rupee notes. Instead, a new 2,000- and limited edition 500-rupee note will circulate. The goal is to root out the “black” money that fuels corruption and diminishes tax revenue. They are targeting the illicit transactions that compose as much as 20% of India’s GDP. Because people have to prove their identity when they hand in the old money, anyone with an unusually large amount can expect a government investigation. They also can expect temporarily empty ATMs that need re-calibrating and mile-long bank lines. Compounding the pain, many individuals have neither bank accounts nor identity proof. As an economy dominated by cash transactions, the disruption has been huge. Certain vegetable sellers in Mumbai have been closing early or entirely. Grocers were said to have accepted the old money for vastly inflated prices. Even those with new money face the challenge of getting change when they try to spend it. Whether looking at the developed or developing world, large denomination notes create negative externalities that primarily relate to illicit transactions. They take us to pondering which form of money is best. For its old 500- and 1000- rupee notes, India declared they would no longer be a medium of exchange. And just through one proclamation, they no longer were money. My sources and more: As always, marginalrevolution is a handy starting place for a good idea. From there, I found some good detail at WSJ but the best summaries on India’s demonetization were at Scroll.in, from Quartz and in assorted Hindustantimes articles. But if you want the big picture, I recommend this Harvard-Kennedy School paper that details the case against large denomination bills and K. Rogoff’s “Costs and benefits to phasing out paper currency“. Please note that Our Bottom Line was previously published in a past econlife post.